Creativity 521 #38 - It's a sh, sh, sh, SHARK! Ever since I read to Angel on a story about Dora going to a carnival and winning a big piñata, I made a resolution that one day I was going to try making my own. It's actually funny to think that after spending days on making a piñata, it gets destroyed in minutes and ends up in the bin. My in-laws saw how much time and effort I spent in making this and they thought it was going to be a decoration for the party. When I explained to them about the Mexican tradition of hitting a piñata till it breaks to get the treats, they were in dismay and said "After all that work, you are going to let the kids ruin it? Why don't you just BUY one?" You see, that's the thing about crafting that not many people will understand. 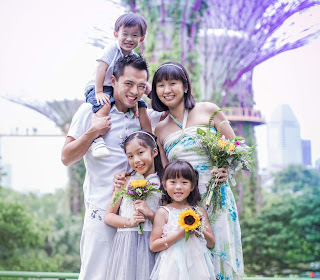 That sense of achievement, that pleasing satisfaction and the realisation that my hands, not my purse, can bring joy to my kids are things that can never be bought with money. So yes, I finally made my little dream come true and though it may be a simple and straightforward piñata, hey, I DID IT. 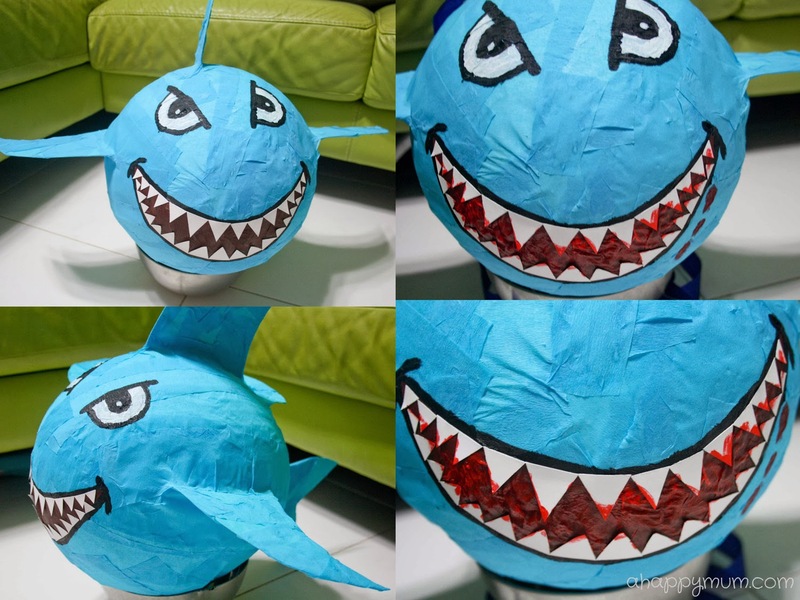 In line with Ariel's Under the Sea birthday party, after much thought about the sea creatures, I decided to make my piñata in the form of a Shark. Firstly, make your own paper mâché paste. You can do this by mixing two parts white glue to one part water, or simply use ingredients from your kitchen. Depending on your balloon size, I took one cup of flour, mixed it with one cup of water and added in a one teaspoon of salt to prevent moulds. Stir well till you get a thick glue-like consistency and add a little water if it is too thick. Next, it is time to get sticky! Tear the newspaper into strips 1-2" wide, dip them in the paper mâché paste, remove the excess paste with two fingers and lay them over the balloon as shown. If you prefer a less messy way to do it, you can use a paintbrush to apply the paste on the strips but make sure you don't leave out any space. Tip #1: You can paint a layer of cooking oil onto the balloon before applying the strips so that it can slip out easily when dry. Tip #2: You need to smooth out the newspaper strips to remove as many bumps and creases as you can so that you will have a better surface for decoration. For me, I decided to use two layers of newspaper and added a third layer of white paper so that my shark would have a fairer and smoother 'skin'. If you decide to paint afterwards, this white layer also makes it easier. Use plain paper that is as thin as possible. You would need to let one layer dry completely before adding the next and to be safe, leave every layer to dry overnight. See, that was why my piñata took me well over three days to make. 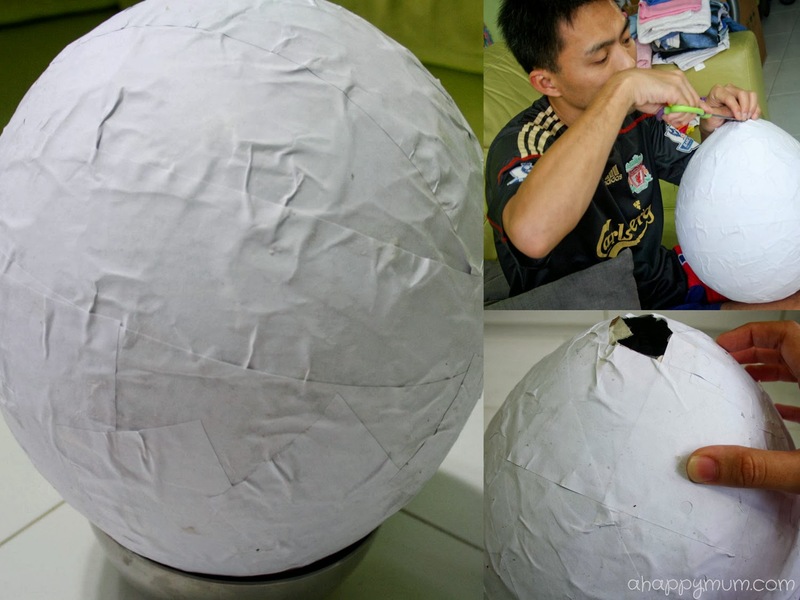 Once it is dry, stretch the top of the balloon, make a small cut and let it deflate slowly. When all the air is out, the balloon should come out easily from the inside of the piñata. Tip #3: Do not remove the balloon when the piñata is still wet or deflate it too fast or there is a chance of your piñata collapsing on itself. If it goes a little out of shape, use a stick to push out the dents from inside. Next comes the fun but time-consuming part and that is decorating the piñata in the shape you want! For me, I decided to use layers of crêpe paper for the body of my shark rather than painting it so that it would have more layers and texture. I also drew out the tail and fins on thin cardboard, cut these out with flaps on the connecting parts (see top picture in above collage), to make it easy to secure onto the body. With the flaps alternating, that is one folds inwards and the next one outwards (see bottom right picture), I secured the body parts using both glue and sticky tape. 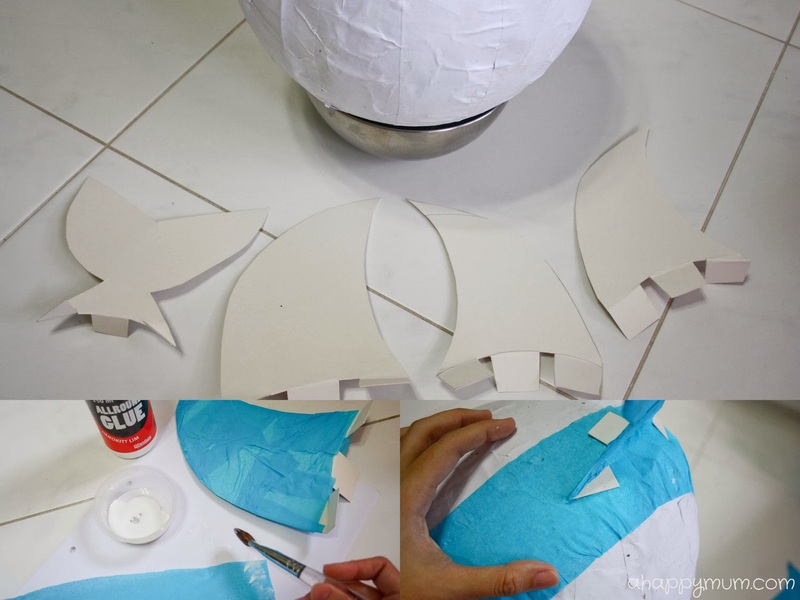 Then, using strips of blue crêpe paper, I applied glue using a brush (see bottom left picture) and covered the shark all around until no more white space could be seen. When you get to the top of the piñata, cut out a flap as shown so that you can put in the treats later. There is no need to secure the opening, I don't know about you but I kept adding things up till the day of the party, but make sure you cover the surrounding area with the crêpe paper. Now, what is a shark without a menacing look? I could have drawn a cute-looking, seemingly pitiful shark but neh, I decided to give it a frown complete with sharp teeth and blood. That would make the kids want to smash it hard, wouldn't it? 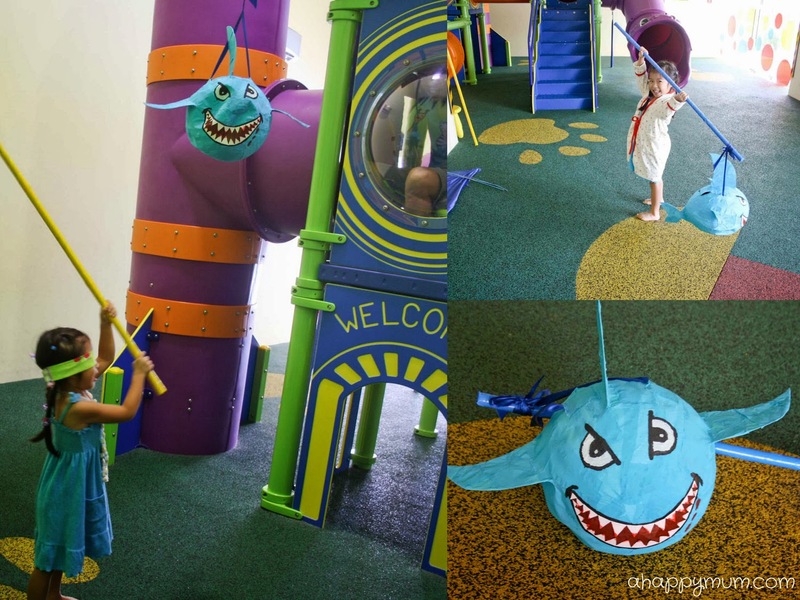 We painted on the eyes and the mouth using acrylic paint, stuck on the teeth using triangular pieces cut out from a thin cardboard and voila, our shark piñata came to life! Tip #4: For the teeth, apply glue only along the edge that will be stuck to the lips of the shark so that the pointed ends jut out and create a three-dimensional feel. 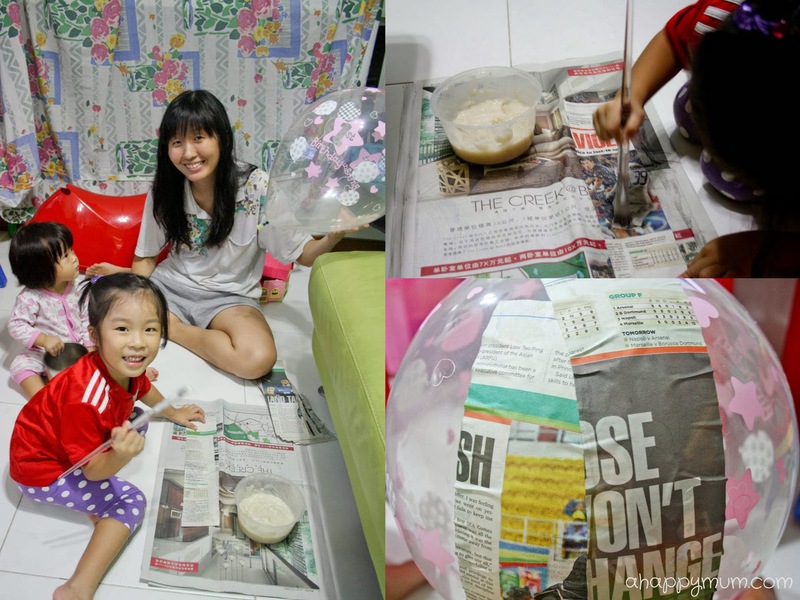 Tip #5: Let the balloon stand on a small bowl when you paint, decorate, stick on newspaper or when letting it dry so that it stays put. Do you like it? Seriously, I was not expecting much out of my first attempt but this piñata was well beyond my imagination and I really loved the final look. Lastly, poke two small holes opposite each other at the top and insert a ribbon or string so that the piñata can be hung up during the party. Oh, and of course, put in as much candies and treats for your little guests as you think your piñata can hold (it is usually stronger than you think it is) and we are all set for a smashing good time! Farewell, my dear shark and thank you for that precious, priceless twenty minutes of fun you provided at the party! Wow it really looks menacing! Its eyes reminded me of angry birds' eyes haha! What a fantastic pinata, and yes, it's always more satisfying when we make stuff ourselves! Haha yeah angry shark! =) You are right, that sense of satisfaction is priceless, isn't it? Well done it looks amazing. We are doing an under the sea party soon too. I'm not sure if have time to make this though...but maybe? Hi Lisa, thanks for popping by! I sure hope you find a couple of days to try making it, it would be awesome for the kids! Haha thanks Sophie! A party is never whole without an awesome looking cake! I get what you mean, take pride in being able to do it as imagined, and sometimes it gets even better and you can't help but feeling that sense of accomplishment. =) Thanks much! Lovely idea with the use of the balloon to make the pinata - it does look mean! Haha mean shark, I like it actually! =p Thanks Agy! This is taking craft to a whole new level. amazing!! Tahlia, you flatter me. Thanks much for the kind comment! Your shark is so cute! I've made a couple of pinatas for my kids' birthdays, but none as nice and my first attempt was almost a disaster. Haha. My next one looked a bit better (see here). It is a bit heartbreaking seeing the kids whack it to bits, but satisfying too, I agree! Wooo I am wondering if I will make this a second time, haha. Going to check out your pinata! Haha it wasn't heartbreaking I think, I felt accomplished seeing them whack it. =p Just gotta make sure I took some pics of it while it was still whole. Tsk. Your shark sure looks fierce! And it looked like the kids at lots of fun whacking it. Hi Susan, thanks! Angel loved the pinata! =) This craft is slightly more time-consuming though I won't say the steps are hard. I am not one who does complicated crafts, like to keep things simple most of the time. 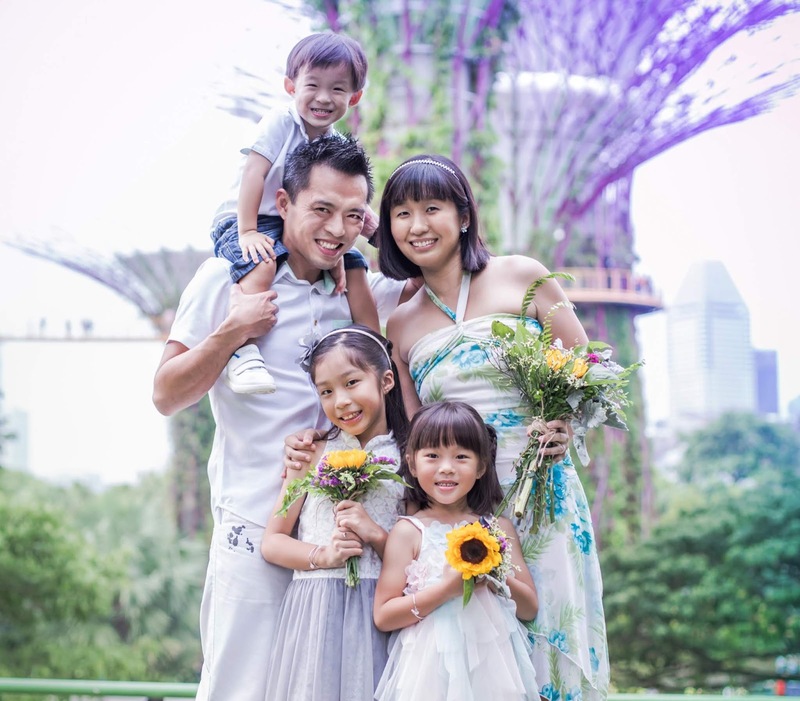 Do share your pictures at her next party, can't wait to see! Thanks for the step by step tutorial! I haven't made a pinata before, but I think I might for my son's next birthday. Could also be a fun activity to do together.